Chief Tamag sailed as a young man with a navigator relative in Ulithi, an atoll about 100 miles to the north of Yap. He is demonstrating the use of the navigator spirit effigy he calls layow. Holding the figure by the head, he points it towards an imaginary storm to ward off bad weather. 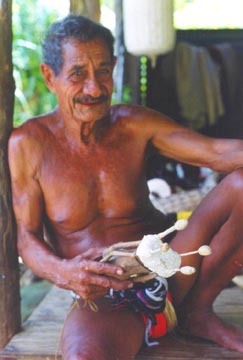 The method used in the Central Caroline Islands is somewhat different in that navigators there characteristically hold the figure by the body rather than the head. In the old days, the four sting ray spines attached to the base would be uncovered before the layow was used. The sharp points of the spines in this photograph are sheathed by small betel nut husks.